This year, the Year 5’s and 6’s at Mundaring Christian College have worked hard in the vegie garden to grow enough produce to enter the Perth Royal Show School Garden Produce Competition. 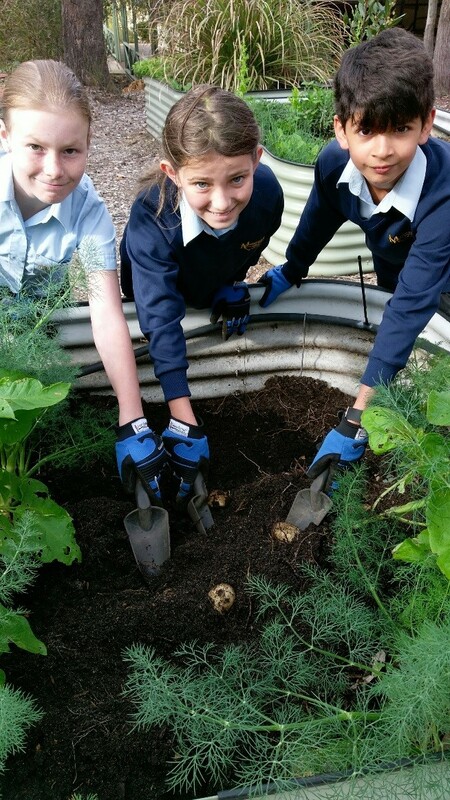 Students had loads of fun digging the potatoes up on Tuesday morning in preparation. All students have participated in a specialist Horticulture course, learning how to grow vegetables and making a self-watering vegie planter from a recycled foam box. One of these planters is to feature in our Royal Show entry, along with the potatoes, lettuces, snow peas and the abundant herbs that have been grown. If you are going to the show these holidays, make sure you check out the MCC entry in the Ellie Eaton Pavilion (Flowers and Creative Crafts) near Gate 1.